Nearly all geomembrane installations are fixed at the perimeter of the containment by burying the liner in an anchor trench or by attaching it to concrete (i.e., a collar wall, foundation wall, etc.). 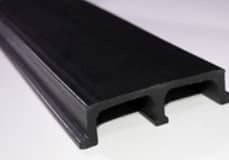 The standard approach for connecting the geomembrane liner to concrete is to use a batten. In this technique, concrete lags are set (i.e., drilled) into the concrete. These are placed on 6" or 12" centers at an engineer’s discretion. A compressible material such as Neoprene or butyl tape is then placed between the liner and concrete, and stainless steel, like 316 SS, or aluminum batten strip, is placed over the liner, and the lag bolts are driven through the batten, liner, and anchored into the lag. The top of the detail is then sealed with a waterproof caulk (see Figure 1). This approach is tried and true and the only option when using geomembranes on sites with existing concrete. However, when working with new concrete, geomembrane manufacturers have had an alternative approach available for some time now: concrete embedment strips. These are “beams” made of the same polymer as the containment liner. They’re embedded into concrete in order to provide a surface on which to weld the liner. Concrete embedment strips are available in most geomembrane polymer types; while their dimensions vary from manufacturer to manufacturer, dimensions are typically around 1" D x 4" W x 10' long (see Figure 2). After an embedment strip is installed by screwing its face to the inside of the concrete form (see Figure 3), concrete is poured (complete distribution of the concrete into the embedment strip is crucial, and vibration of the concrete is important). When the form is removed, the surface of the strip is revealed. Cleaning the embedment provides a surface on which to weld the geomembrane (see Figures 4a and 4b). The geomembrane is then welded with hot air to the embedment strip. (see Figure 5). Speed of installation: Welding to an embedment strip can reduce the time it takes to attach a liner to concrete—it can save you anywhere from minutes to hours. Cost reduction: Stainless steel batten and anchors are expensive. Those, along with the additional hours of labor, can add up to a greater cost for the geomembrane installation. Using a concrete embedment strip can be a less expensive alternative. Use in horizontal or vertical applications: Embedment strips have been used in both, but underwater connections of any type should be minimized. Installation quality: It’s important the strip be affixed to the forms so that it remains level and has a good end-to-end connection—the point at which the ends of the strips touch should be sealed. Cost: Many concrete contractors will be unfamiliar with this exact system, but will be familiar with similar embedded connections. Providing clear specifications is essential. Thermal expansion can be a problem during construction or after the project is complete. If the embedment expands (or contracts) after the concrete is poured, it can distort the shape of the embedment strip in the uncured concrete (on any axis), creating an uneven welding surface. After the concrete is cured, expansion/contraction of the embedment strip can cause cracking or separation of the strip from the concrete. Thermal expansion/contraction is most likely to occur in polyethylene (PE) embedments. At the other end of the spectrum, ethylene copolymer liners and embedments have a coefficient of thermal expansion that is roughly two orders of magnitude less than that of PE. Normally, the concrete embedment strip and the parent geomembrane must be the same polymer. Finally, installation guidelines vary by manufacturer. It’s important to comply with each manufacturer’s unique guidelines when using their form of embedment strip. When properly installed, concrete embedment strips are a cost-effective alternative to mechanical battening. What is your experience with using concrete embedment strips as an alternative approach for attaching geomembranes to concrete? Tells us about it in the comments!